The Flying Elephant at Park Hyatt Chennai recently invited us to an evening of cocktails and malts. 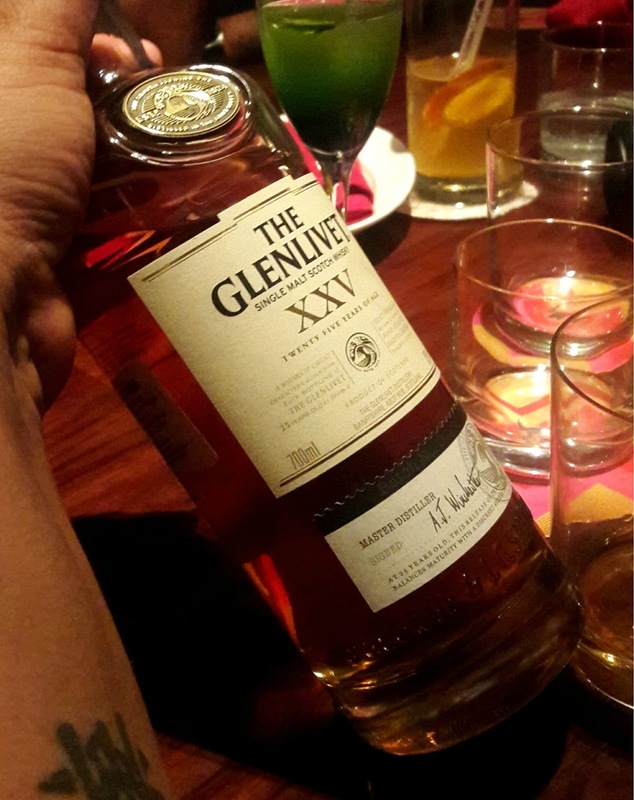 It was co-hosted by Whisky Samba, a popular resto-bar in Gurgaon. 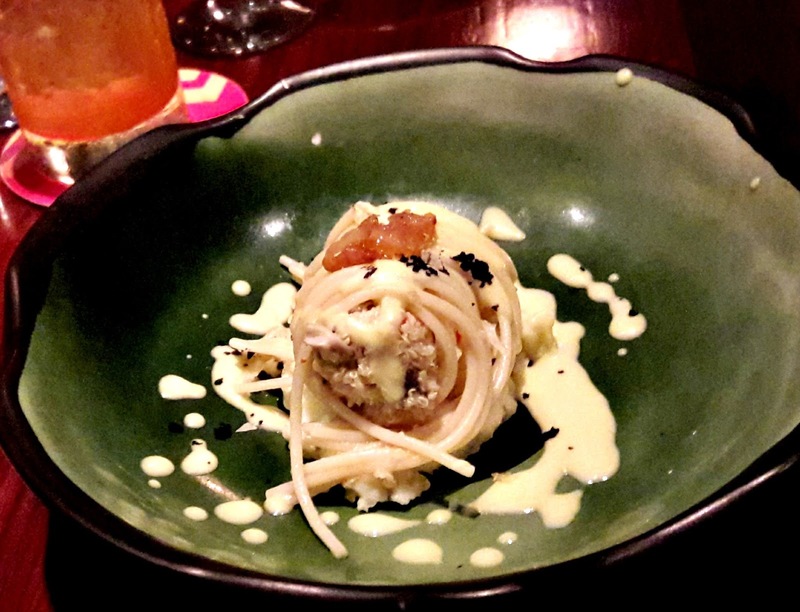 A fabulous 8 course menu was created just to be paired with the whiskies at this 2-day pop up event. Imagine a bar that stocks 140 whisky brands. And more are being added to that number even as you read this. Part of Whisky Samba's charm is the food created by Executive Chef Akshay Bhardwaj, who has been working hard on a menu that combines mixology and progressive cooking. What kind of food goes well with whiskies or whisky-based cocktails? Pat came the answer from the chef - smoked food and tandoor-cooked would enhance the taste and smokiness of a whisky. 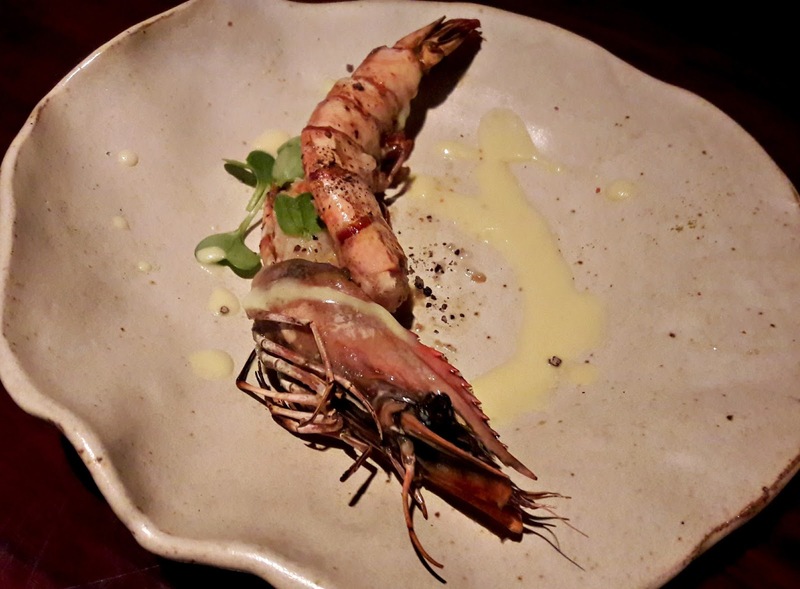 This chef certainly knows a thing or two about progressive food, having worked at 2 star Michelin restaurant, Noma, under Chef René Redzepi. He's also worked at restaurants in France and Brussels. Devesh Kailash Dhall of Whisky Samba talked to our group of 6 about the whisky and cocktails they had planned for that evening. 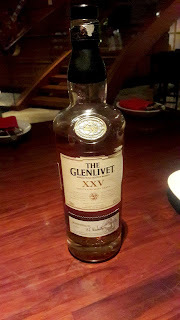 He also talked about Speyside distilleries and the Glenlivet label that is made there. Our first 2 cocktails, Irish Maid and Frisky Whisky had Jameson as a base while the third had Ballantine. Along with Jameson, the flavours of muddled cucumber and elderflower liqueur in Irish Maid were rather refreshing but tame. The second cocktail, Frisky Whisky with honey, orange, bitters and more Jameson was even better. 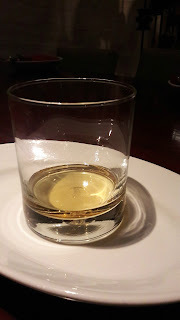 The Ballantine's Tango had more complex notes of orange rind and mango, a hint of pear and smokiness from the whisky itself. 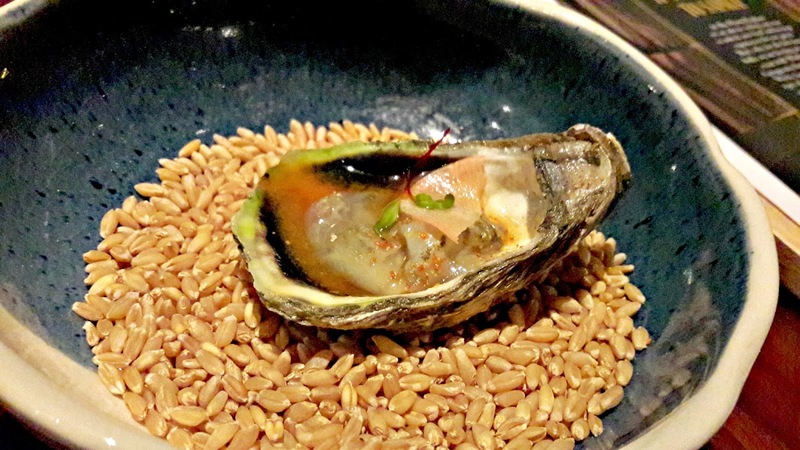 For starters, there were oysters with miso broth and kimchi which did dominate the the mild taste of the mollusc. Not only smoked but even fermented food pairs well with malts. 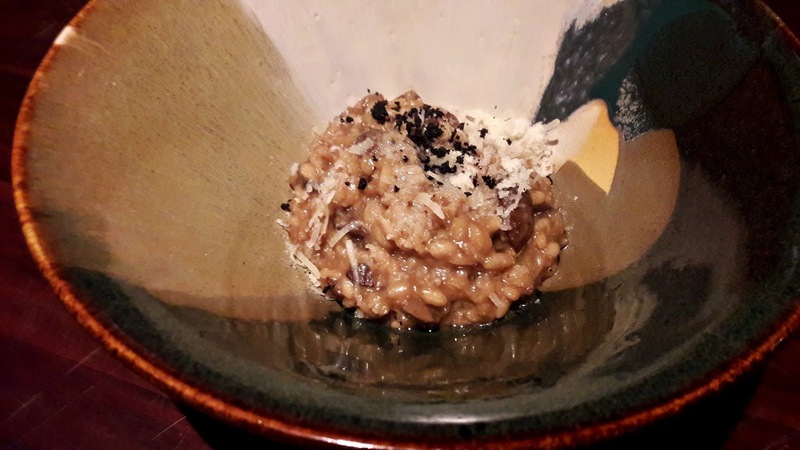 Rice disc topped with tomato and coconut? 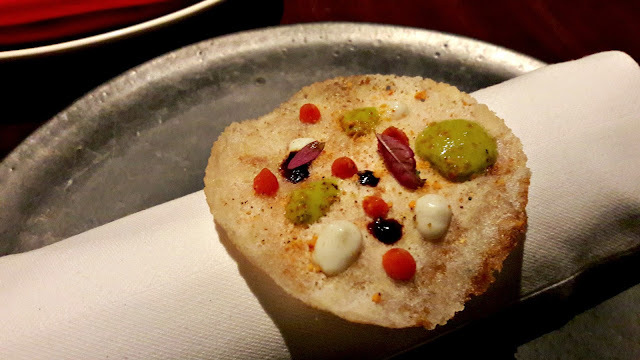 This did look and taste quite like a dosa with chutney. The disc was crisp but could have been crisper. The cocktails took a backseat as the 3rd course began. 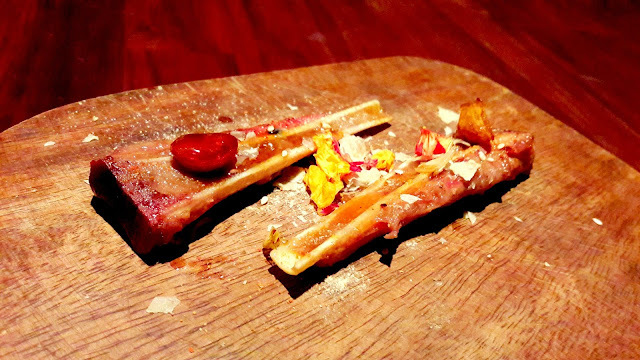 Bone from the shoulder of lamb was neatly sliced down the middle, cooked to perfect doneness. Even the marrow was intact! To finish, it was sprinkled with olive dust and koji onion. 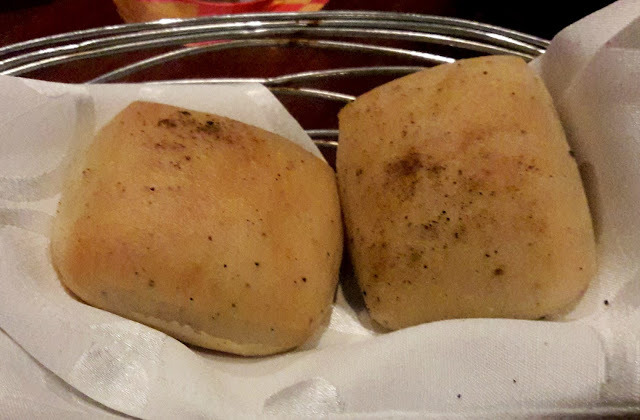 The caramelised garlic resting on it stole the show. 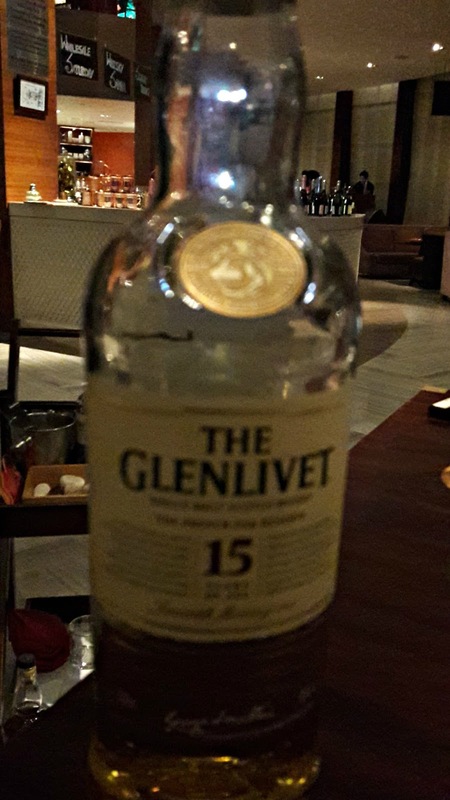 The Glenlivet 15 years old was paired with the meat, enhancing the toasty nuttiness of the whisky. 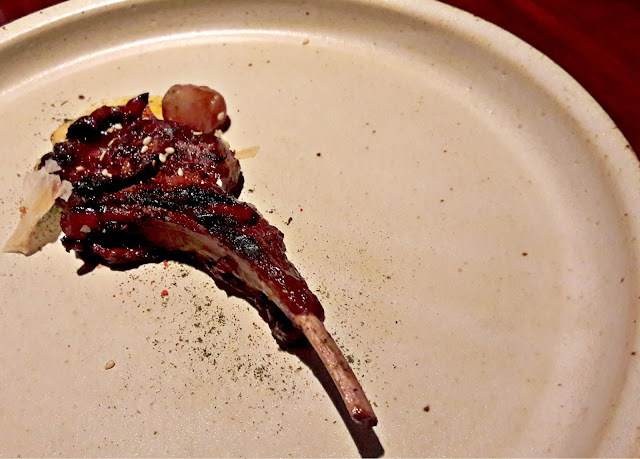 Course 4 - tender Australian lamb chop, garlic, burnt garlic and soya. 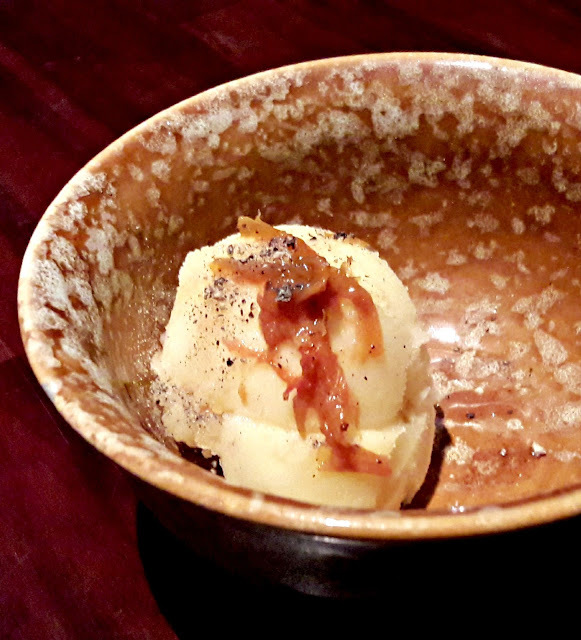 The flavours were beautiful yet earthy, once again paired with The Glenlivet 15 year old. 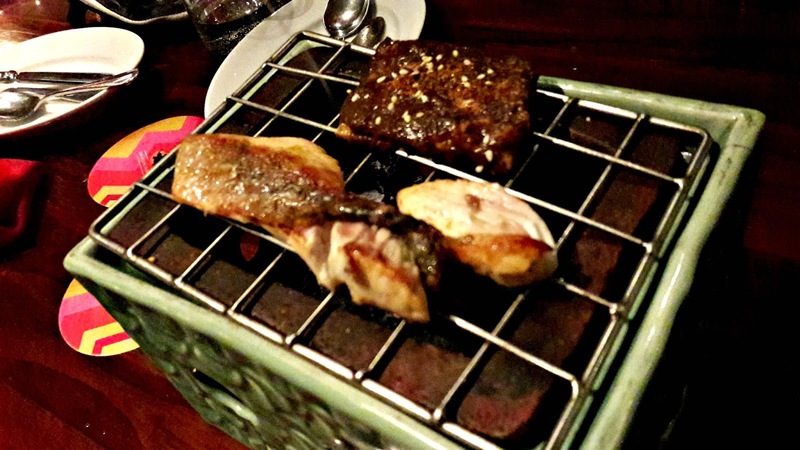 The 6th course was presented on a table brazier, filling our noses with a delicious aroma. Yeah, fish ribs which we were encouraged to pick up with our hands and eat. The wakame served beside it had a chewy, gelatinous texture, perfectly in sync with the fish theme. The Glenlivet Founder's Reserve was the pairing malt. The meal had a surprise end - stuffed betel roses and fermented flowers. 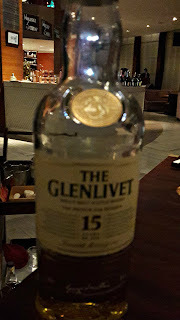 Dunked into liquid nitrogen, it was a fitting pairing with smooth and fruity The Glenlivet XXV. Do follow @ParkHyattChennai on social media if you would like to be informed of these exclusive events. 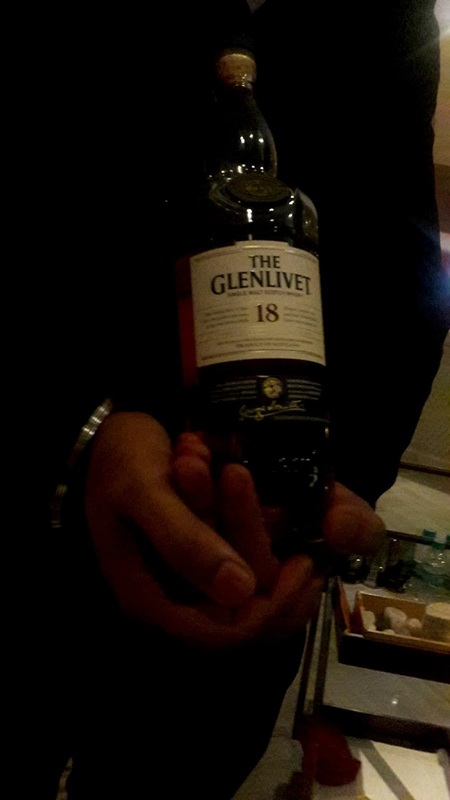 Chef Akshay did say that food that's smoked and slightly charred, as in tandoor-cooked is best with whisky. Then again, we had no Indian flavours in any of the dishes, except maybe the rice crepe and betel roses.